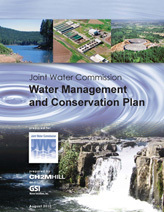 The Joint Water Commission has completed a five-year update to its Management and Conservation Plan. The plan has been been approved by the State of Oregon Water Resources Department. Please click the icon below to view the plan. The document is almost 6 MB and may take several minutes to download. The 2015 Water Management and Conservation Plan Five-Year Progress Report is available for download. The progress report was approved by the State of Oregon Water Resources Department on October 26, 2015.